One of my favorite mainstays, pasta alla carbonara (this time its bucatini, probably one of the most underappreciated pastas this side of the Atlantic). It's simple, comfort food, and goddamn delicious. No cream! Every single time I've seen this dish in a restaurant there is always cream in the sauce. Unnecessary and it kills the taste. 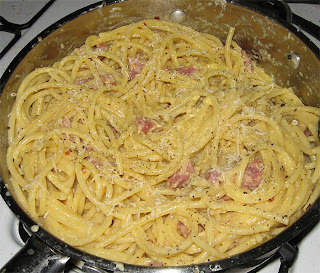 Carbonara is simply pancetta, pecorino romano, pepper, and egg. I add a bit of garlic, dry white wine, and red pepper. Do what you want with it, just don't add cream. You can't really get pancetta around here, I always pick some up when I'm in a coastal city (bought some in New Haven recently). Bacon is a substitute, definitely a second best though. Make sure you get some good slab bacon if you do. Here's how I do it: first, whisk your eggs. 1 egg per portion. Grate some pecorino romano, a small handful per portion. Add this to the whisked eggs and mix together. Start your pasta. Along the way, temper your eggs with some of the water from the pot. In a sautee pan: depending on the fattiness of your pancetta, add more or less olive oil. The stuff I got last is pretty lean, so I add a couple tablespoons of oil. Sautee pancetta on low heat until it renders most of its fat, then add the optional garlic and sautee till you smell its aroma (do not let it brown). Add the wine, and simmer it all on medium for a couple minutes. Add your pasta and combine in the pan. You want the pasta to get fully coated in the fat and olive oil. When your pasta has been well coated by the oil and fat, add the egg and cheese mixture and stir to coat the pasta. Keep heat low enough that you don't get scrambled eggs but high enough to cook the eggs. Approx 1 egg per serving size. Serve hot.